Drop down menu or the quick access menu or from several other forms within EasyDose. The patient’s table holds relevant details of patients and is most significant in EasyDose. Patients are recorded as Active/Inactive which affects how they are viewed in the Patient Browser Form. From here, an Active patient’s access is provided to Prescriptions, Payments and Dosings. If this patient receives dosings at a different cost, the default costs can be overridden here. Comments can be entered against the patient and can be highlighted on the dosing form by placement of a tick in the check box. Identifiable marks are also entered in this screen along with a patient’s scanned in photograph. This form is accessed from the Patient Browser Form by double clicking on a patient record or selecting the patient in the list and clicking Select Patient. If no prescription has been entered against this patient, the Dose Patient With, will clearly indicate this. (See image below). The image below depicts a standard Patient Details Form without other functions turned on. Queensland and New South Wales option only…. The following image depicts the Patient Form with the Extended Takeaways enabled and 30 takeaway capability enabled. 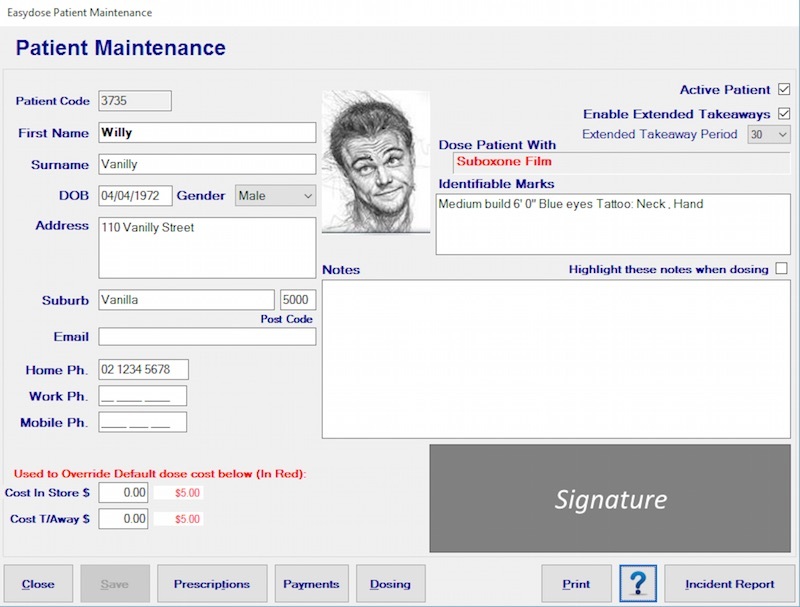 The final form below depicts the Patient Form with the Signature pad enabled and the ability to add a patient signature. Navigate to the required patient. Click on the picture placeholder/silhouette. The file dialog box will open. Photograph will appear on form. Click Save to retain image. Note 1: Once the images are saved in the database they are no longer required to remain in the picture folder on the computer’s hard drive. Note 2: For best results take a close up photo of the patient’s head and shoulders, this should not require editing. If necessary, images can be sized and cropped in picture editing software before importing into EasyDose. Close – Closes the form and returns system to the quick access menu. Save button – Only enables when a record has been changed. Prescriptions – Navigates to the current patients’ prescription records and provides the ability to add a prescription from here. Payments – Navigates to the current patients’ payment records and provides the ability to add a payment from here. Dosing – Navigates to the Dose Patient Form of the current patient. 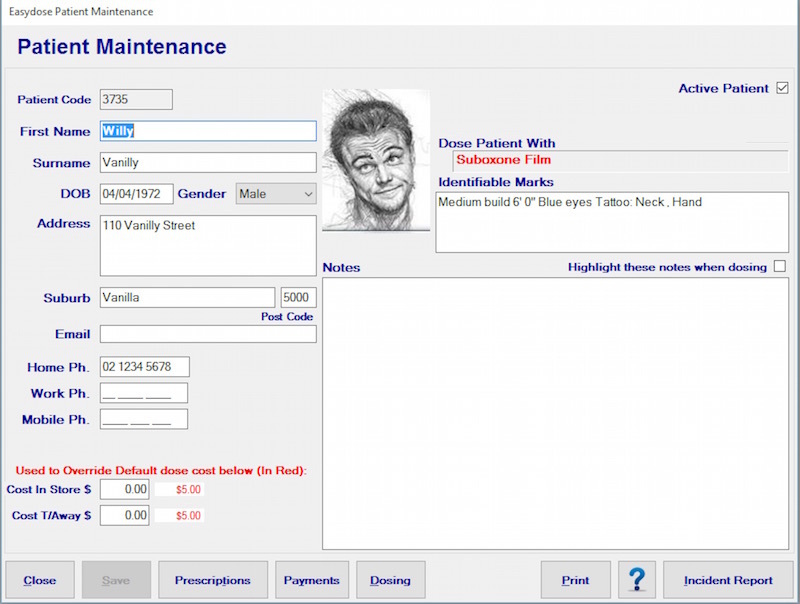 Print – Prints the patients’ details.
? – Opens the EasyDose website at this page. 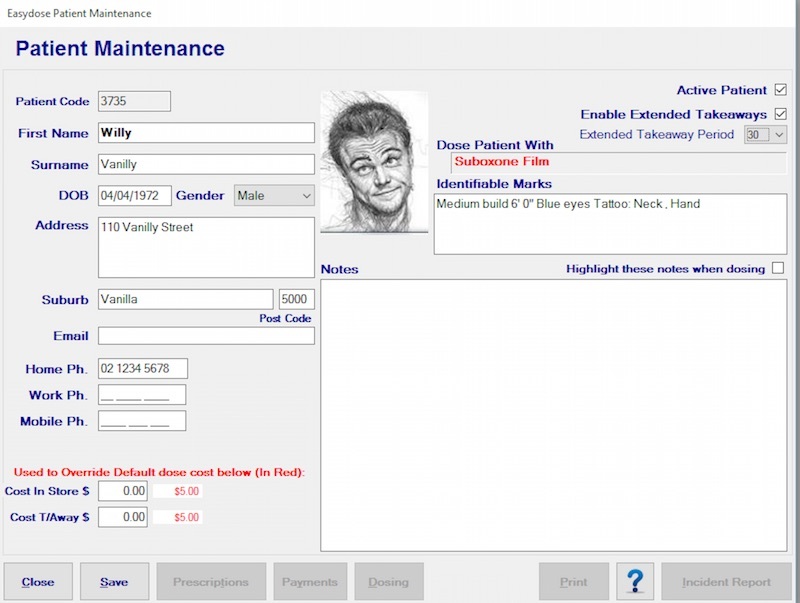 Incident Report – Add/edit Incident Reports relative to this current patient. These can be emailed to the appropriate authority. If an amount is entered into the ‘Cost In Store’ or ‘Cost T/Away,’ this will override the default dosing costs set in the System Options. If left at $0.00 the patient will be charged, per dose, at the rate set in the system options. Detailed notes can be entered against each patient. If these notes are of special concern and should be brought to the attention of the dosing pharmacist, a ‘tick’ can be placed in the tick box, ‘Highlight these notes when dosing’. When this patient is dosed, the Dosing Form (Special Alert on Notes) will bring these notes to the attention of the pharmacist at the of dosing.